44-25. RESPECTFUL WORKING ENVIRONMENT. The following behaviors are inconsistent with a respectful working environment and are impressible: (a) verbal abuse, which includes, but is not limited ot, obseene, threatening, humiliating or intimidating language; and (b) non-verbal abuse, wich includs acts that are threatening, humiliating, or intimidating. Individual , group, or school-wide meetings shall not be utilized to threaten, humiliate, or intimidate bargaining unit members..." (Agreement between The Board of Education of the City of Chicago and Chicago Teachers Union Local 1 American Federation of Teachers AFL-CIO. July 1, 2012 - June 30, 2015. After being part of the largest convention committee meeting in the history of the American Federation of Teachers and then been part of the floor debate before the 3,000 delegates and visitors to the July 2014 AFT convention, I was left with a couple of related things on my mind: Bullying and B movies. And it wasn't just because the Chicago delegation was housed in the historic Biltmore Hotel, where more movies have been made and scene shots than at any other hotel anywhere. The behaviors we were watching from some people with lots of power reminded us why we had put an "Anti Bullying" article in our new contract (won by our Chicago Teachers Strike of 2012) and could easily be traced in many cases to the B movie wannabeism that soaks rooms in cliches and dead metaphors. Our anti-bullying language may have saved the convention from some embarrassing moments. Only George Orwell's Politics and the English Language can save us from the clich�s and dead metaphors. There were three things that kept clinking in the back of my mind while I sat through the Common Core debates at the 2014 convention of the American Federation of Teachers in Los Angeles from July 10 through July 14. Above, at the Friday night forum on "Social Movement Unionism", the president of the New York City local of the American Federation of Teachers went back to his textings, while the president of the Los Angeles local (far right) was explaining how the new leaders of the teacher union in the nation's second largest city was taking power (they took office on July 1) after winning an election based on the model of unionism that had been improved in the Chicago Teachers Union. 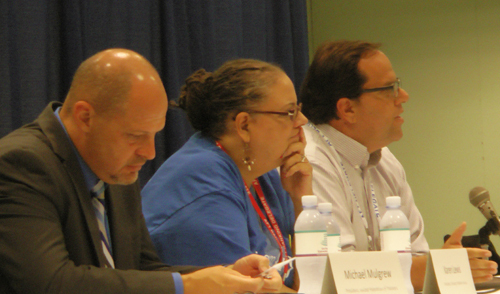 Karen Lewis, the president of the AFT local in the nation's third largest city listened to Caputo Perl, while Michael Mulgrew had better things to do. Substance photo by Norm Scott. The first was how silly the loyalists of the AFT leadership were on the floor of the debates. Most of those who were the silliest came from the massive delegation from New York City, but there were others, from the traditional loyalists in other locals (many of which have been decimated because they woke up too late to the fact that you can't compromise with aggressors -- and corporate school reform and its various test implementations (including Common Core) has been an aggressor for more than 15 years. After being pushed around both in the committees that decide the fate of the convention resolutions and then in full view of many of the 3,000 delegates and visitors during the convention's general sessions, several people from the Chicago delegation -- all of them women and every one of them a union leader who is still a classroom teacher -- complained of being bullied, almost always by a male delegate from New York City. Michelle Gunderson Tweeted that the New York people had "made convention debate into a contact sport." In his first report on the events in Los Angeles, Norm Scott, who has been active in the United Federation of Teachers (AFT Local 1) offered the opinion that the "Midwesterners were too nice" by not fighting back more, shall we say, actively. Other women from the Chicago delegation who had helped prepare the resolution against Common Core had similar experiences and similar opinions. The second thing was how patronizing the "democracy" preached by AFT President Randi Weingarten actually is. During the convention and later in her confused and imprecise press release trying to explain the heatedness of the debate, I listened and heard her talk about how proud we (disclosure: I am a delegate to this convention from the Chicago Teachers Union, Local 1) should be about all the "passion" that we were showing during the debates. It began pounding in my head that what she was saying was one of those "You're so beautiful when you're angry..." clich�s that rattle around in some people's minds every time they provoke a fight and then stand aside to watch the results. And make no mistake: the AFT leadership had provoked these fights, both before and during the convention, and when the cameras were turned off and people weren't recording a lot, it was clear that those who were part of Randi's leadership -- broadly, the "Progressive Caucus" and more narrowly a handful of locals, led by the New York City local with hundreds of delegates -- were going to "win" on the key issues "by any means necessary." So part was the snarl and part was the charm, and these leaders seem to believe that they can get away with both. Last was the tsunami of bad metaphors and shoddy non-sequitors that pumped out like something from a toxic pipeline out of the mouths of the (mostly male) speakers who promoted the Party Line in support of the Common Core and more broadly against anyone who had an idea that hadn't already been sanitized by the leadership. It's still convention time, and I have to get back to the main hall for the final debates. But I wanted to begin writing these ideas as they had become clear both during the key debates on Common Core (I was part of the "Educational Issues" committee debates and votes; then present in the convention hall throughout the huge debate and votes on Common Core). Since a lot of what we report during the conventions can be read, critiqued and utilized by our brothers and sisters now and later, we will all be expanding on these observations.